Capital of the Zapotec civilization, c. 800 BC - 1530 AD. Monte Albán, in today's Oaxaca state of Mexico, served as the capital of the Zapotec civilization for about one millenium, from 100 BC to 900 AD. It was the epicenter of their culture and a place of divine worship, inhabited by goldsmiths, silversmiths, priests and astronomers, by farmers and by royalty. 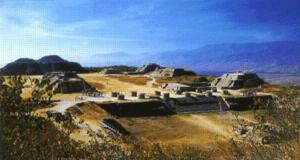 Monte Albán was built as a planned city around 800 BC. An area of more than three hectares at the top of a hill was flattened and converted into a Great Plaza, an immense marketplace surrounded by temples, other public buildings and a sports field for the national ball game tlachtli. The city centre had a commanding location 400 m above the valley floor. The entire city covered 20 hectares. All streets followed a rigid pattern. Peasant suburbs stretched down the hillside; an irrigation system supplied the fields in the valley with water. 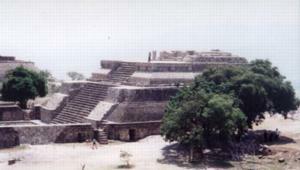 The population of Monte Albán is estimated at 30,000 people. The culmination of Monte Albán's history as a Zapotec centre came around 500 AD; it shows clear influence of the architectural style of Teotihuacán. After 900 AD the importance of the city diminished, and the city went into decline. During the following centuries it was inhabited by Mixtecs, who used the old Zapotec tombs and structures, which produced a fusion of the two cultures. The city was still inhabited at the time of the Spanish conquest in the 16th century, which brought the end of Monte Albán as a human settlement. 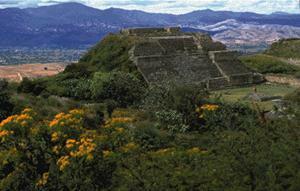 Monte Albán is located high above the valley floor. Several public buildings were grouped around the Great Plaza. The largest pf the temples.